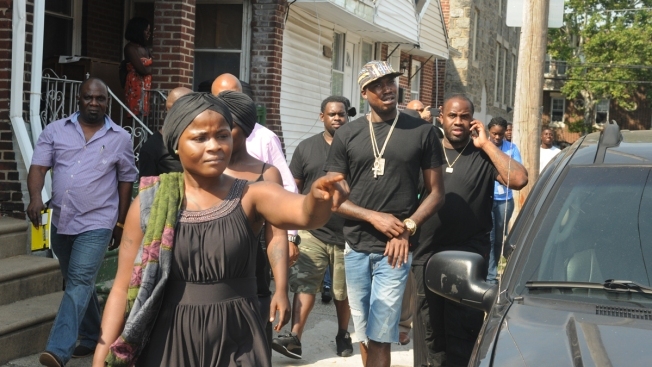 Comfort Bowah shows Philly rapper Meek Mill the where the fire damage is on Gesner Street. As tensions continue to rise in a Southwest Philly community reeling from a tragic fire, a local hip hop star visited the neighborhood to show his support. Robert Williams, better known by his stage name Meek Mill, arrived on the 6500 block of Gesner Street Tuesday afternoon to tour the scene of a fatal fire that killed four young children on Saturday. The 27-year-old rapper, who grew up in North Philadelphia, walked along the block as a crowd of onlookers surrounded him. "I just wanted to come by and show my support to all of the families and everybody that was hurt by this situation," Meek said. "I feel I'm in a position where I can help these people. Anything I can do to help them with their losses, I'm gonna do it." The rapper said he plans on donating money to the victims of the fire. "It feels good to have him show up for us and to know that he cares," said Comfort Bowah, the older sister of Maria and Marialla, two of the girls who were killed in the fire. "He came to show us love when other people won't do it and I'm happy that he did that for us." During the visit, Patrick Sanyeah, the father of the two boys who were killed in the fire, 4-year-old Patrick Sanyeah and 1-month-old Taj Jacque, described his last moments with his son to Mill. "I had just cut his hair, dropped him off," Sanyeah said. "I told him, 'Daddy gone pick you up later.' But my son died in this house. I want to thank Meek Mill for coming here. That's a real thing you're doing brother. We're all fathers. To everyone, we need help. We need the whole city's help so this doesn't happen to somebody else." Mill’s appearance comes a day after a protest outside a local fire station nearly spiraled out of control. At least three people were arrested and a woman was hospitalized after around 200 angry residents protested outside the Engine 40 & Ladder 4 firehouse on Woodland Avenue. The protesters claimed there was a delayed response to Saturday’s fatal fire. Mayor Michael Nutter, Fire Commissioner Derrick Sawyer and First Deputy Chief of Staff Everett Gillison denied these claims and released a timeline of the response.